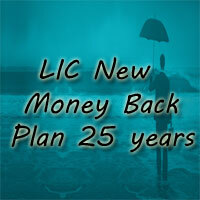 LIC New Money Back Plan 25 years (Plan. No: 821) is a Participating non-linked With-Profits Limited Premium Payment Plan. LIC Money Back Policy 25 years was introduced by the Life Insurance Corporation of India (LIC) on 06th June 2014 with a Unique Identification Number of 512N278V01. Lic has introduced this attractive Money Back-25 years Policy to provide Combination of Death and Survival Benefits, Which means it provides Protection against Death throughout the Policy Term along with the Periodic Payment on survival at specified durations during the Term. The unique Combination of this Policy Provides financial support for the family of the deceased policyholder at any time before the Policy Term and gives lump sum amount on the Maturity of our Policy. Death Benefit: Death Benefit means the Amount / Benefits Received by the Nominee on the Death of the Policy Holder. The Death Benefit can be defined as the Sum of “Sum Assured on Death” and Vested Simple Reversionary Bonuses and Final Additional Bonus, if any, shall be payable. LIC Money Back 25 years Plan is a New Money Bank Plan introduced to provide the Combination of Death & Survival Benefits. The Unique Feature of this Policy is, it provides the Death Claim of Full Sum Assured without Deducting any Survival Benefit. Simple Reversionary Bonus is payable on Policy Maturity or on earlier death. Guaranteed Surrender Value, which is the Percentage of the Total Premiums Paid excluding Total Premium Paid and Premiums for Riders, shall be payable on surrender of the Policy. Minimum: 13 years.Maximum: 45 years. Premium Paying Term 20 years. By Using the LIC Money Back Policy 25-years Premium Calculator, You can calculate the Minimum Premium that has to be Paid to take the Policy. The Amount of Premium Paid will depend on the Premium Payment Modes. You need to enter Some Basic Information like Name, Mail Id, Mobile Number, Age, Policy Term, and Minimum Sum Assured to calculate the Premium Value. Life Insurance Corporation of India is offering a Special “Accidental Death and Disability Benefit Rider” under this New Money Back Plan 25 years (Plan No. 821). By Paying Additional Premium, Policy Holder can avail this “LIC’s Accidental Death and Disability Benefit Rider“. Check the below Conditions required to get the LIC Accidental Death and Disability Benefit Rider. Maximum Accident Benefit Sum Assured: An amount equal to Basic Sum Assured subjected to the maximum of RS. 50,00,000/- overall limit by taking all existing policies of the Life Assured under individual Policies as well as Group policies. For every 1,000 Rs./- Sum Assured 2.00 Rs/- rebate. For every 1,000 Rs./- Sum Assured 3.00 Rs/- rebate. CEIS Rebate: An Employee of the Corporation is eligible for the Rebate on the tabular Premium under Corporate Employees Insurance Scheme (CEIS). The Employee will get CEIS Rebate of 10% on the Tabular Premium for Basic Plan a well as for “Accidental Death and Disability Benefit Rider”. You can Buy the LIC Money Back Policy 25-years from the Nearest LIC Branch Office or through online at the LIC’s Official Website or From the LIC Agent. The Documents required for buying LIC New Money Back Plan 25 years are listed below. The Claims available under LIC New Money Back Plan 25-years are Maturity Claim and Death Claim. Risk Cover: LIC Money Back Policy provides Risk Cover to the Policyholder. The Coverage Details are Mentioned below. Minimum Sum Assured: No Limit. Loan Facility: Loan facility is available under this plan after the policy acquires paid up value. The Loan as a percentage of surrender value shall be as under. For in force/fully paid-up policies: up to 90%. Policy Revival: LIC New Money Back Plan 25 years can be revived before two years from the date of First Unpaid Premium (FUP). Surrender Value: The LIC Money back policy 25 years policy can be surrendered at any time during the policy term by Successful Payment of Premiums for full three years. 1. What If I Want to Surrender my LIC New Money Back 25-years Policy? You can avail the Guaranteed Surrender Value on Surrendering the LIC Money Back Policy at any time during the Policy Period. 2. Can I Revive My LIC New Money Back Plan 25 years? Yes, you can revive your Lapsed Policy within two consecutive years from the Date of First Unpaid Premium. A Grace Period of 1 Month not Less than 30 Days is available for yearly, Half-yearly Premium Payment Modes and 15 Days for Monthly Mode of Premium Payment. 4. Is Loan Facility available under this LIC New Money Back Plan 25 years? Yes, Loan Facility is available under this Plan after the Policy acquires Paid-up Value.